Diseñado sobre la base del carro Christie M1931 y producido en la planta de locomotoras Járkov Komintern (KhPZ). 650 vehículos BT-2 y 1.884 BT-5 fueron producidos desde 1932 hasta 1935. Long and low to the ground, it is as sleek and fast as it looks. While the BT-2 is extremely fast and has a decent selection of guns, its armor is paper thin. In the first few tiers this is not such a huge drawback, but as firepower increases, it is vital to get into good habits for light tanking early. The first lesson is to keep moving and use cover as much as possible. Long charges across open terrain are suicide, no matter what speed you're going. Instead, dash between all available cover, use your agility to throw in some evasive maneuvers, and above all, keep your speed high. If the BT-2 is used correctly, then it can achieve record-breaking kill and damage records as compared to other recruit match tanks. It's relatively powerful, even with the thin armor. The BT-2 leads to the BT-7. While the German tier 2 light tanks are more general purpose in nature, the Soviet BT-2 was designed for speed. With this tank you will begin learning tactics that will apply to all light tanks at higher tiers. The BT-2 is ideal for seizing key areas quickly, and it can use its great acceleration to move back and forth to dodge enemy shells. The 45mm 20k is an excellent gun, with good damage per shot and excellent penetration, however the poor dispersion of .46 will limit the BT2's long range combat abilities. The armor is very thin, and cannot be relied upon to bounce any shells, however, against the numerous auto-cannons found at tier II, it may score a few lucky bounces. The BT2 also benefits from a superb camouflage rating, and can be used for early game scouting, however the slow turn speed may put you in a tight spot if the enemy surprises you. 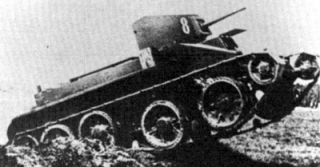 The BT-2 was a part of a Soviet light tank series produced from 1932 to 1935. The BT tanks (Russian, Bystrokhodny tank, light "fast tank" or "high-speed tank") were a series of Soviet cavalry tanks produced in large numbers between 1932 and 1941. They were lightly armoured, but reasonably well-armed for their time, and had much better mobility than the rest of the world's contemporary tank designs. The BT tanks were known by the nickname Betka from the acronym, or its diminutive Betushka. The direct successor of the BT tanks would be the famous T-34 medium tank, introduced in 1940, which would replace all of the Soviet fast tanks, infantry tanks, and medium tanks in service. The BT tanks were "convertible tanks". This was a feature designed by J. Walter Christie to reduce wear of the unreliable tank tracks of the 1930s. In about thirty minutes, the crew could remove the tracks and engage a chain drive to the rear-most road wheel on each side, allowing the tank to travel at very high speeds on roads. In wheeled mode, the tank was steered by pivoting the front road wheels. However, Soviet tank forces soon found the convertible option of little practical use in a country with few paved roads, and it consumed space and added needless complexity and weight. The feature was dropped from later Soviet designs. Christie, a race car mechanic from New Jersey, had tried unsuccessfully to convince the U.S. Army Ordnance Bureau to adopt his Christie tank design. In 1930, Soviet agents at Amtorg, ostensibly a Soviet trade organization, used their New York political contacts to persuade U.S. military and civilian officials to provide plans and specifications of the Christie tank to the Soviet Union. At least two of Christie's M1931 tanks (without turrets) were later purchased in the United States and sent to the Soviet Union under false documentation, in which they were described as "agricultural tractors". Both tanks were successfully delivered to the Kharkov Komintern Locomotive Plant (KhPZ). The original Christie tanks were designated fast tanks by the Soviets, abbreviated BT (later referred to as BT-1). 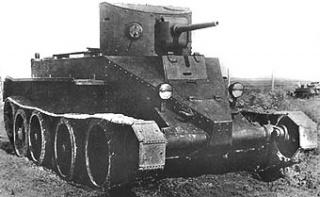 Based both on them and on previously obtained plans, three unarmed BT-2 prototypes were completed in October 1931 and mass production began in 1932. Most BT-2s were equipped with a 37 mm gun and a machine gun, but shortages of 37 mm guns led to some early examples being fitted with three machine guns. The sloping front hull (glacis plate) armor design of the Christie M1931 prototype was retained in later Soviet tank hull designs, and later adopted for side armor as well. The BT-5 and later models were equipped with a 45 mm gun. BT tanks saw service in the Spanish Civil War, Battle of Khalkhin Gol (Nomonhan), the Winter War in Finland, the Polish campaign, and in the entire World War II. They first saw action in the Spanish Civil War. A battalion of BT-5s fough85'� the Republican side, and their 45 mm guns could easily knock out the opposing German and Italian light tanks. During the Battles of Khalkhin Gol (also known as the Nomonhan Incident), which lasted from May to September in 1939, BT tanks were easily attacked by Japanese "close quarter" teams (tank killer squads) which were armed with petrol bottles (later called "Molotov Cocktails"). The Soviet BT-5 and BT-7 light tanks, which had been operating in temperatures greater than 100F on the Mongolian plains, easily caught fire when a molotov cocktail ignited their gasoline engines. General Georgy Zhukov made it one of his "points" when briefing Joseph Stalin, that his "...BT tanks were a bit fireprone...." Conversely, many Japanese tankers held the Soviet 45mm anti-tank/tank guns in high esteem, noting, "...no sooner did they see the flash from a Russian gun, then they'd notice a hole in their tank, adding that the Soviet gunners were accurate too!" After the Khalkhin Gol War in 1939, the Soviet military had broken into two camps; one side was represented by Spanish Civil War veterans General P. V. Rychagov of the Soviet Air Force, Soviet armour expert General Dimitry Pavlov, and Stalin's favorite, Marshal Grigory Kulik, Chief of Artillery Administration. The other side consisted of the Khalkhin Gol veterans led by Generals Zhukov and G.P. Kravchenko of the Soviet Air Force. Under this cloud of division, the lessons of Russia's "first real war on a massive scale using tanks, artillery, and airplanes" at Nomonhan (Khalkhin Gol) went unheeded. Consequently, during the Finland War (Winter War), the BT-2 and BT-5 tanks were less successful, and it took the Soviet Union three and a half months, and over a million men, to do what Zhukov did in just ten days at Nomonhan. After the German war broke out, the Spanish Civil War faction fell in disfavor, with Marshal Kulik in particular being court-martialed and demoted. Gen. Zhukov and the majority of his surviving Nomonhan veterans were appointed to commands throughout European Russia, in time to engage the German armies. During the Second World War, BT-5 and BT-7 tanks were used in the 1939 Soviet invasion of Poland, and in large numbers in the battles of 1941: during which thousands were abandoned or destroyed. A few remained in use in 1942, but were rare after that time. The Red Army planned to replace the BT tank series with the T-34, and had just begun doing so when the German invasion (Operation Barbarossa) took place. During the final weeks of World War II, a significant number of BT-7 tanks took part in the invasion of Japanese-occupied Manchuria in August, 1945. This was the last combat action of BT tanks. The BT tank series was numerous, forming the cavalry tank arm of the Red Army in the 1930s, and had much better mobility than other contemporary tank designs. For these reasons, there were many experiments and derivatives of the design, mostly conducted at the KhPZ factory in Kharkov. The most important legacy of the BT tank was the T-34 medium tank, arguably the most important tank of the entire World War II. In 1937, a new design team was formed at the KhPZ to create the next generation of BT tanks. Initially, the chief designer was Mikhail Koshkin and, after his death, Morozov. The team built two prototypes. The light one was called the A-20. The more heavily armed and armoured BT derivative, theA-32, was a "universal tank" to replace all the T-26 infantry tank, BT cavalry tanks, and the T-28 medium tanks. Such a plan was controversial, but concerns about tank performance under the threat of German blitzkrieg led to the approval for production of a still more heavily-armoured version, the T-34 medium tank. Along the way, an important technical development was the BT-IS and BT-SW-2 test-bed vehicles, concentrating on sloped armour. This proof-of-concept led directly to the armour layout of the T-34. BT tank chassis' were also used as the basis for engineering support vehicles and mobility test-beds. A bridgelayer variant had a T-38 turret and launched a bridge across small gaps. Standard tanks were fitted as fascine carriers. The RBT-5 hosted a pair of large artillery rocket launchers, one on each side of the turret. Several designs for extremely wide tracks, including, oddly, wooden 'snowshoes' were tried on BT tanks. The KBT-7 was a thoroughly modern armoured command vehicle that was in the prototype stage when World War II broke out. The design was not pursued during the war. In the Kiev maneuvers of 1936, foreign military observers were shown hundreds of BT tanks rolling by a reviewing stand. In the audience were British Army representatives, who returned home to advocate use of the Christie suspension on British cruiser tanks, which they incorporated from the Cruiser Mk III onwards. Interestingly, the pointed shape of the hull front armor on the BT tank also influenced the design of the British Matilda tank. - BT-1: Christie prototype with no turret. - BT-2 Model 1932: M-5-400 engine (copy of U.S. Liberty engine), three modifications of turret produced: with single 37 mm gun; 37 mm gun and one DT machine gun; twin DP machine guns mount and a single machine gun. In late 1932 modified to BT-3 but produced under same designation. - BT-3: same as BT-2, produced according to metric system (instead of Imperial system as used for BT-2). In official documentation referred to as BT-2. -	BT-5: larger cylindrical turret, 45 mm gun, coaxial DT machine gun. -	BT-5 Model 1933: new turret with twin hatches and larger bustle. -	BT-5PKh: snorkelling variant (prototypes only). -	BT-5A: artillery support version with 76.2 mm howitzer (few made). -	BT-5 flamethrower tank: (prototypes only). -	PT-1A: amphibious variant with new hull (few made). -	BT-7 Model 1935: welded hull, redesigned hull front, new Mikulin M-17T engine (licensed copy of a BMW engine), enclosed muffler. -	BT-7 Model 1937: new turret with sloping armour. -	BT-7TU: command version, with whip antenna instead of earlier frame antenna. -	BT-7A: artillery support version with 76.2 mm howitzer. -	OP-7: flame-thrower version with external fuel panniers (prototype only). -	BT-7M (1938, prototypes designated A-8; sometimes referred to as BT-8): new V-2 diesel engine replacing earlier gasoline engines, three DT machine guns: coaxial, in P-40 AA mount on roof and in a ball-mount on turret rear. -	BT-42: Finnish assault gun; captured BT-7s were equipped with British 114 mm howitzers. -	BT-IS: Prototype/proof-of-concept platform with heavily sloped armor; forerunner of the armor design on the T-34. -	BT-SW-2 Cherepakha ("turtle"): Another prototype, which took the armour sloping to an extreme. 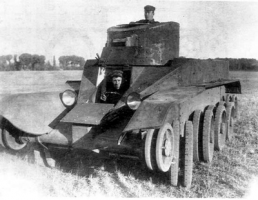 -	A-20: Prototype for a new BT tank, with 20 mm armour, 45mm gun, model V-2 diesel engine, and 8×6-wheel convertible drive. Lost out in trials to the A-32, which was further improved and produced as the T-34 medium tank. -	TTBT-5, TTBT-7: teletanks, remote-controlled tanks. Esta página fue modificada por última vez el 25 oct 2016, a las 10:53.